Enjoy a cup of our loose leaf Rooibos teas. The price on your tea may fluctuate as Tea and Herb prices change on the global market. At BananaDog we will always give you the best price possible. Thank you for your continued support. Fruity with a sweet note. 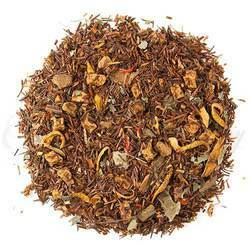 The vanilla flavoring gives the Rooibos a wonderful exotic jazzy depth. 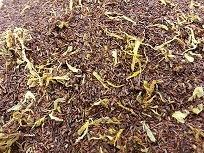 Ingredients: Red rooibos, Calendula petals, Almond slices, Almond Oil, Natural flavors. Envelop your palette with this bewitchingly sweet blend of ripened bananas swirling in a symphony of rich, silky chocolate and spicy pink peppercorns. Ingredients: Envelop your palette with this bewitchingly sweet blend of ripened bananas swirling in a symphony of rich, silky chocolate and spicy pink peppercorns. Bountiful pear notes express themselves with mild sweet cinnamon. 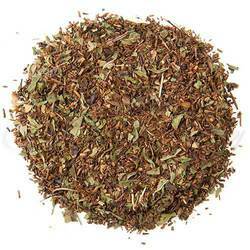 Ingredients: Rooibos, Cinnamon, Apple & Pear pieces, Blackberry leaves, Safflower & Orange flower petals, Natural flavors. Mountain Green is a delightfully sweet citrus, high in antioxidants with South African Green Rooibos, South Africa Orange Peel and Australian Lemon Myrtle. A great substitute for green tea without the caffeine or bitterness associated with green tea. Ingredients: Green Rooibos, Orange Peel, Lemon myrtle. Superb lemon freshness intermingles with flavory Rooibos. Light mint finish. 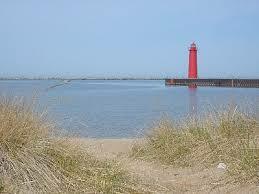 Just like a day at the beach in Lakeside. Ingredients: 100% Organic ingredients. 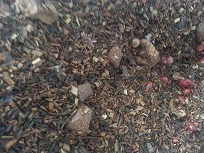 Rooibos, Lemon pieces, Peppermint leaves. 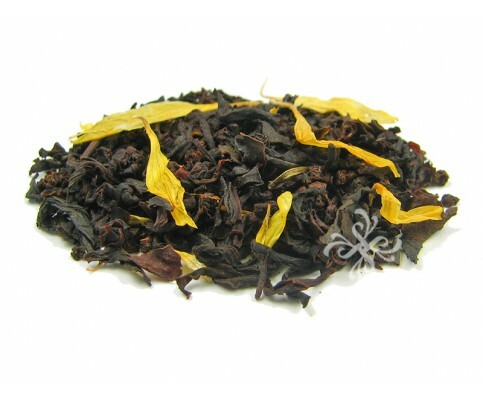 Select black tea with passionfruit essence. A long lasting, sweet flavor and aroma that is enjoyable either hot or iced. Ingredients: Black Tea, Marigolds, Natural Flavors. Sweet and sultry peach notes accentuated by the fruity apricot-like rooibos transporting you to peach haven. 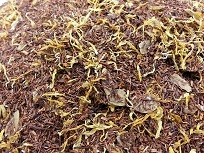 Ingredients: Rooibos, Calendula petals, Blackberry leaves, Natural flavors. This delightful caffeine free dessert blend is a delectable infusion of enticingly sweet and tangy flavors harmoniously complimented by the soothing smoothness of fresh cream. 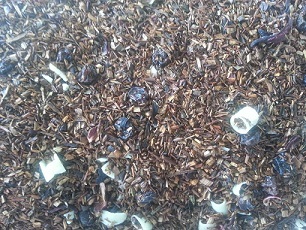 Ingredients: Organic Rooibos, Organic Honeybush, Organic Hibiscus, Organic Black Currants, White Chocolate, Natural Flavors.